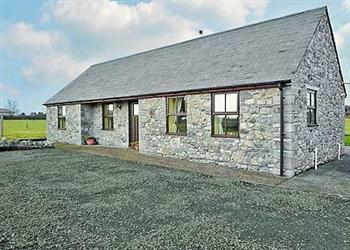 Banagher in sleeps 5 people. Peaceful rural location. Detached character cottage for 4/5. This is one of two roadside cottages situated in a peaceful rural area 3 kilometres from Banagher on the River Shannon and within 2 hours drive from Dublin. Stone built, wheelchair friendly and very tastefully decorated with all modern conveniences in an open plan setting. A super base with numerous attractions from Birr Castle Demsene (7 miles) to Conmacnoise and the popular Bog Train, not to mention seven 18 hole golf courses within easy driving distance. Also nearby you can visit parklands, castles and mountains or try fishing. Shop and pubs 3 miles. All on ground floor: Living room. Dining room/kitchen. 2 bedrooms: 1 double, 1 twin with additional single. Bathroom with shower over bath and toilet. Gas central heating included. Elec by coin meter. Bed linen included. Washer/dryer. Dish washer. Shared lawned garden with furniture. Barbeque. Parking (3 cars). Holidays at Banagher run from Saturday to Saturday. For a better idea of where Banagher, Co. Offaly is, you can see Banagher, Co. Offaly on the map below. Do you want to holiday near Banagher, Co. Offaly (W5143), you can see other cottages within 25 miles of Banagher, Co. Offaly; have a look to find your perfect holiday location.